Florida Gov. Ron DeSantis has suspended embattled Broward County Sheriff Scott Israel. The suspension, effectively immediately, was issued via executive order 19-14, on Jan. 11. “Sheriff Israel has repeatedly failed and has demonstrated a pattern of poor leadership,” DeSantis said in a statement. Israel has faced intense criticism over his handling of the Marjory Stoneman Douglas High School mass shooting on Feb. 14, 2018, when 17 people were killed by alleged gunman Nikolas Cruz, including 14 students, in what is considered the worst school shooting in U.S. history. But as facts of the event began to surface, beginning with Broward Deputy Scott Peterson’s decision to hide during the shooting, Israel’s portrayal of his leadership unraveled—although he maintains he did nothing wrong. Andrew Pollack, whose daughter Meadow was slain in the shooting, tweeted Friday morning with advanced knowledge of Israel’s dismal. “I have waited on today for over 9 months @browardsheriff @RonDeSantisFL Tune in to hear the announcement at 3 p.m. #fixit,” Pollack wrote. Broward is Florida’s second-most-populous county next to neighboring Miami-Dade. By law, governors can suspend public officials for neglect of duty, incompetence, and malfeasance. Israel, a Democrat, was serving his second elected term as Broward’s sheriff. 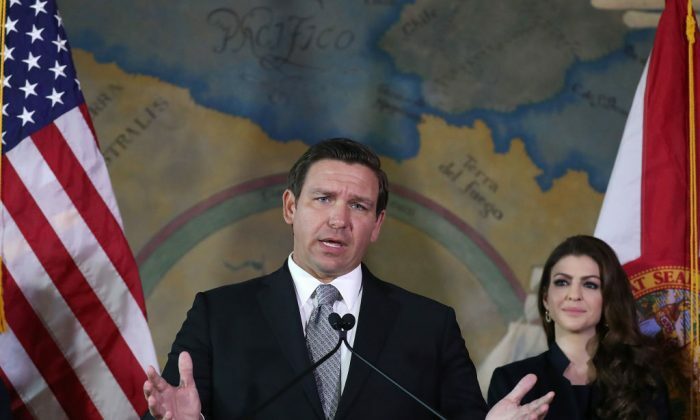 On the campaign trail, DeSantis said that if he were governor during the shooting, he would have already suspended Israel. On Dec. 11, he made it official. “He failed to protect Floridians and visitors during the tragic Fort Lauderdale International Airport shooting in 2017. He failed in his duties to keep our families and children safe during the devastating shooting at Marjory Stoneman Douglas High School on February 14, 2018. These incidents demonstrate Sheriff’s Israel’s repeated incompetence and neglect of duty,” DeSantis said. But Kaplan also said Israel will fight a suspension. “He is steadfast in believing he has been elected to serve Broward County and will remain so until such time as there’s a new elected sheriff,” he said. The Broward Sheriff’s Office already has paid Miami super-lawyer Ben Kuehne almost $30,000 in legal fees, according to documents obtained by the Orlando Sentinel. Kuehne previously helped reinstate Miami Lakes Mayor Michael Pizzi after Gov. Rick Scott suspended Pizzi over federal bribery charges, of which he was later acquitted. Kuehne once served on Vice President Al Gore’s legal team during the 2000 presidential election recount. Israel would have to stand trial before the Florida Senate before being reinstated, though he’s not likely to find many allies in the Republican-dominated chamber. Meanwhile, a federal judge ruled Jan. 9 that suspended Broward Supervisor of Elections Brenda Snipes had her constitutional rights violated when Gov. Rick Scott suspended her over the Broward midterm election fiasco that threw three statewide races, including those involving both Scott and DeSantis, into controversy. A similar outcome isn’t inconceivable given Israel’s defense that mistakes were made by his deputies, not him. A 458-page commission report, issued on Jan. 1, outlined numerous failures by the sheriff’s office and the Broward public school system but stopped short of recommending Israel’s suspension, instead leaving the issue to then-Gov.-elect DeSantis to decide. The commission report cites alleged shooter Nikolas Cruz’s documented history of problems and failed institutional responses. Prior to the mass shooting, there were 69 incidents on record where Cruz engaged in concerning behavior, talked about guns, threatened someone, or committed violence. The FBI was contacted twice in the six months prior to the shooting, with one concerned person alleging that Cruz was capable of murdering teachers and students. But tragically, nothing came of it. The report recommended an investigation of seven Broward deputies who arrived at the shooting and failed to take any meaningful action. Cruz was a former student at Marjory Stoneman Douglas High School who entered school grounds and shot indiscriminately without ever entering a classroom. Scott Peterson, a deputy who was assigned to protect the school for exactly this type of event, was discovered to have fled to the parking lot rather than confront the danger. Body camera footage later showed another deputy casually rummaging through his vehicle during the shooting spree. Cruz blended in with other fleeing students to walk away from the massacre unobstructed. He was finally taken into custody an hour and 16 minutes after the shooting began. The commission cited a potentially devastating policy reversal made by Israel after taking office, when he changed the existing active shooter procedure to deputies “may” confront a shooter, from deputies “shall” confront active shooters. That policy isn’t shared by many Florida sheriffs, and allowed Broward deputies to avoid what many critics have said is their most basic responsibility. DeSantis appointed Gregory Tony interim sheriff. Tony, a former sergeant at the Coral Springs Police Department, which borders Parkland, is the first African-American sheriff of Broward County. He was recommended by Andrew Pollack, whose daughter was killed in the attack. “He’s a law-and-order-type policeman who wants to do right by the community and keep the community safe,” Pollack told Politico.